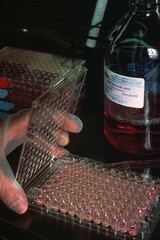 A tray of prepared wells, being held by a rubber-gloved hand. The top is up on the tray, indicating it is complete. Also visible is a bottle of the medium used in the preparation. Cells that make monoclonal antibodies are sorted and grown in wells. This is a tray of such wells.